I am offering 10% off all items in my Etsy Shop as a way of wishing you all a Happy Holiday Season! Enter coupon code WINTER at checkout to receive your discount! I hope a special new pincushion or needlebook added to your sewing space might be just what you need to re-motivate yourself to getting back to stitching! Please see my upcoming blogs as I plan to share new quilting techniques to make my quilts look more like the ones that I see in quilt shows! 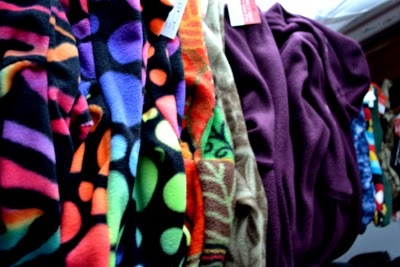 Fleece socks and a fleece robe, so turn down the heat and stay warm! I am doing Christmas sewing including fleece socks, a fleece robe and two patchwork duvet covers that are to be "warm-up exercises" (excuse the pun) to what is going to be a year of quilt making in 2015. This does not mean that I will stop making wool pincushions, penny rugs, lap throws,or other wool work or fleece socks, but I am going to dust off my traditional quilting skills and recommit myself to finishing some of the quilts that I have not completed. I am also going to learn new machine quilting skills. 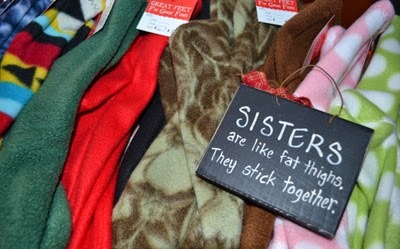 Adding a bit of humor to my sister's socks! Patchwork blocks + extra materials for this duvet cover. When is Christmas? And more materials for another duvet cover. What about next Christmas? Shortly after graduating as a nurse in the early 1970's, I took a pause from nursing to work in a Montessori pre-school which wasn't far from a well-known quilt store in Colorado. Health-wise, I wasn't tolerating rotating shift work, a routine part of life for hospital nurses that I had failed to consider when I chose this profession. This reprieve did more than provide day-work, it brought me into the world of quilting at Quilts and Other Comfort's, a quilt store owned and run by Bonnie Lehman, a well-known quilter, quilt collector, and author of several quilting books. Bonnie and her daughter later became well known for the popular quilting publication, Quilter's Newsletter. Bonnie's daughter, though but a young woman at the time, became the graphic artist of this popular quilting magazine and Bonnie's store provided instruction, materials, quilting equipment and patterns. My job at the Montessori preschool did not last long. It seemed that setting up this business was more expensive than the owners counted on and having an aide that was an RN was a luxury they couldn't afford. I had just taken a Sampler Quilt Class at Quilts and Other Comforts and had gotten to know the manager of the store when a sales position opened. My mom was as excited as I was about quilting and she encouraged me to take this once-in-a-life-time job until my health issues regarding rotating shifts passed (or so we hoped it would at that time)!. My employee discount made it such that my mother and I could invest in quilting patterns, needles, hoops, frames and materials all at discounted prices, an advantage that neither of us could pass up, though we both were clueless that our lives would never be the same! I later returned to nursing and not long after, graduate school for special education, but my mother's and my interest in quilting became life-long. I was her quilting buddy and we conferred about our creations. Being retired, she often hand-quilted my quilts while I helped her to lay hers out or make decisions regarding her design work. I have decided that it is well past time that I finish what I have started. I have several quilts in various states of completion as well as my mother's last quilt to finish. It is the most beautiful of all of her quilts and I have to work up to feeling confident enough to be worthy of this task. All in all, I have seven quilts to finish.This seemed to be an overwhelming and daunting number, until I read and studied quilter, Teresa Rawson (www.fabrictherapy.blogspot.com). I have mentioned this quilter before in some of my other blogs. She is a prolific quilter who does very intricate hand-appliqued quilts much like my mother did. She, along with Bonnie K. Hunter, another prolific scrap quilter have inspired me to take-on my unfinished quilts as well as dream of doing many more. 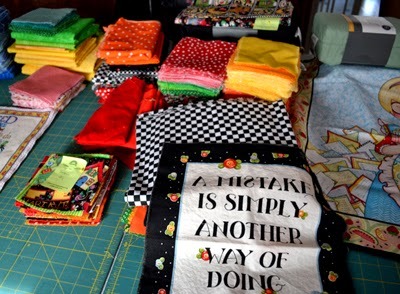 Teresa's blog has many tutorials, including one on organizing materials and projects to make the most of your sewing time. In Bonnie's book, Scraps & Shirttails II, Continuing the Art of Quilting Green, she shares her methods of organizing her scraps to make the most of her time and space as well as using every bit of material that happens to be lying around. Now my family closely watches their laundry and doesn't leave it lying around! Favorite shirts are just the thing for a quilter! Don't miss her website and blog (www.quiltville.com or www.quiltville.blogspot.com) to consider inexpensive ways to obtain quilting materials as well as getting hints as to how you can organize and store your scraps and materials and start thinking big enough to dare yourself to finish your UFO's (unfinished objects)--don't we all have them as sewers and quilters? 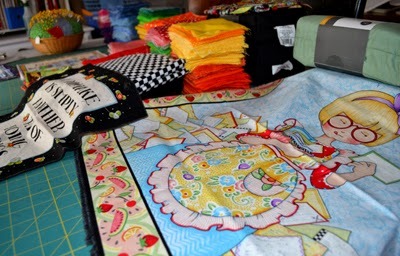 As I prefer short-term projects, I have decided that if I break down the tasks involved in finishing my quilts and move from one to another, I will be able to maintain my interest, re-develop skills not used in some time and develop the new ones I need to accomplish these long-term projects step by step. It is rare when I simply start a project and work on it start to finish. Likely it has something to do with some ADHD related to my Chronic Lyme. I simply work with it now and as long as I am stitching, someday a multitude of projects will reach completion. I have seen it work on smaller projects and now I am going to try it with my quilts. How fortunate I am to have a retirement filled with sewing and quilting! I have been building a fine collection of quilt books, hard plastic cutting stencils, quilting stencils for hand or machine quilting, along with various materials. Many items have been purchased used and discounted through Sewitsforsale, a yahoo group on line. 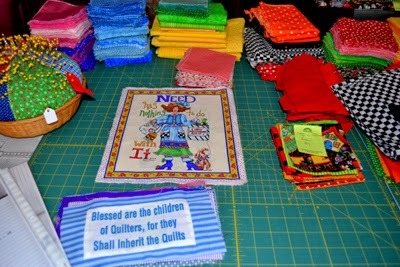 I am sure that my organization systems will continue to change as I take on this quilting challenge. I hope that you, my readers will enjoy reading about my journey and might even care to join me. I will pass on tricks I learn and hope you will offer me tips and suggestions too. I am already learning skills that I had either forgotten or missed years ago when I first started quilting. I am intentionally starting with simple projects, warming up to those that are more involved. Although I am not a beginner quilter, I am going to focus on details that years ago, I thought I might skip in the interest of saving time. Now I want my quilts to look as good as those I see at quilt shows! No hurry on this one, but another simple comforter to practice simple skills! 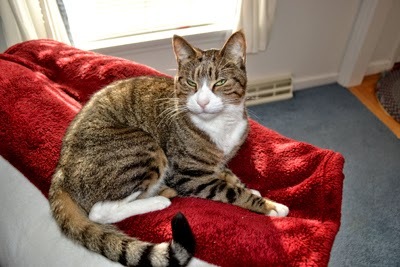 Zeldie, my new quilting buddy says, "You woke me to show me what?"